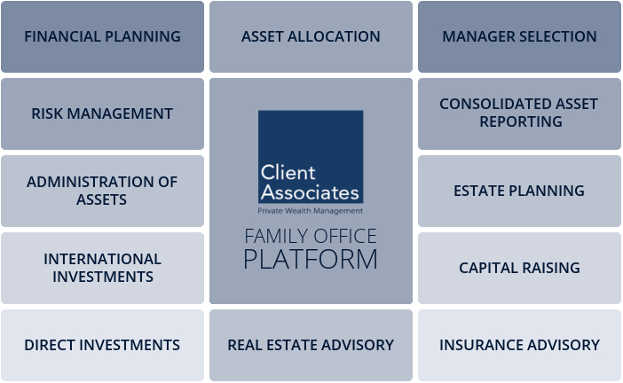 Geared towards providing more than 'Wealth Management' Services, the Client Associates Family Office aims to preserve and grow family wealth for the enjoyment of present and future generations. This is done through a combination of data science proven proprietary mathematical models to achieve the targeted growth of wealth followed by a systematic transfer of wealth for the future generations. Ideally suited for families with managed wealth upwards of $ 10 mn and above Client Associates Multi Family Office (MFO) Platform works as the Family CFO for such families helping them consolidate their family's private wealth under a single window professional management umbrella. A true to label MFO with no fund of our own gives us the freedom to deliver bespoke advice for the right asset allocation that the family requires to meet its financial goals in harmony with their acceptable appetite for risk. This is complemented by our independence to select the best in class asset managers and investment strategies as per the mandate of our private clients. Need for your Family Office assumes critical significance in a situation where multiple wealth managers are managing sizeable private wealth for your family. Such circumstances create the need for a professional Family Office platform that would provide family centric holistic and non-conflicted advice, ongoing risk management, keep track of the consolidated reporting, administration of assets and tracking the value addition by each wealth manager. As part of CA's Family Office Platform, we offer extended support and services illustrated below.